Customizing Your UI- Types & Modifiers! Note #1: Before getting into this guide, make sure that you’ve read the general guide about connector inputs and outputs- it’ll make understanding this guide much easier! Note #2: This content only applies to connectors created after 4/20/17, or those with a connector flag “enableNewMetadata” set to true. Otherwise, your connector will run on old dynamic input and output format. To use this new format, navigate to this URL in connector builder, with the appropriate values subbed in: https://build.ui.azuqua.com/(ORG ID)/(CONNECTOR NAME)/full. Once there, underneath the key “channelformat”, add in “enableNewMetadata” and set it to true. Although we can support many connectors with the basic input and output options (“name” and “type”), there are many connectors that may benefit from having slightly more control over how users can interact with your connector. You can do this by altering the types of your connector filed, which affects how that data can interact with other items inside of your users FLOs, or by altering modifiers which change how the information is presented to your users. 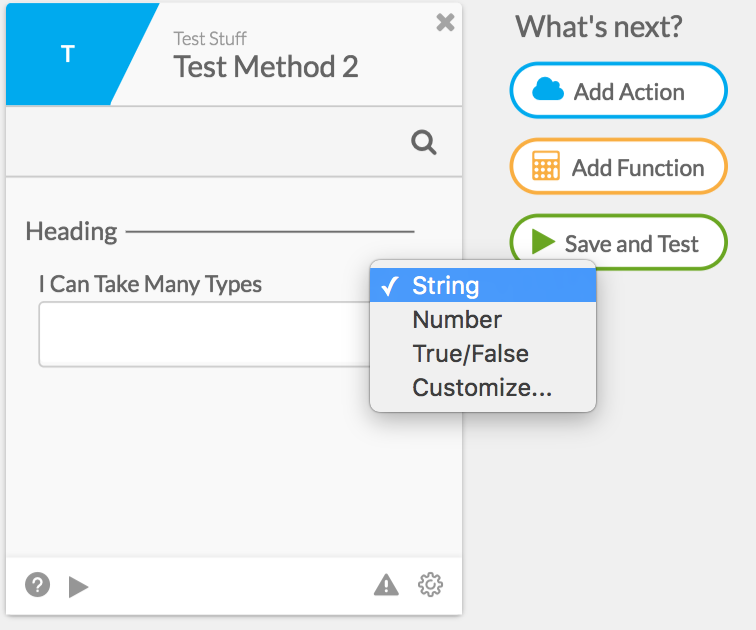 _Using any of Azuqua’s standard types- _Setting these appropriately can completely change the way users interact with your connector. Setting a connector field to accept strings may be the most generalized way you can pass around information in Azuqua, but restricting fields to only be certain types allows for more accurate errors, etc from Azuqua at runtime. The supported types are “string”, “object”, “Date”, “file”, “boolean” and “number”. _Creating a complex object as an output field- _When a connector field is set to be of type “object”, it can be a simple object, where the user just passes in/receives an object with any fields inside of it. However, outputs inside of Azuqua connector methods may also be a complex object, with a specific structure of fields defined before runtime. _Setting a field to be a collection- _You may also set a field to accept/output a collection of items of any type. 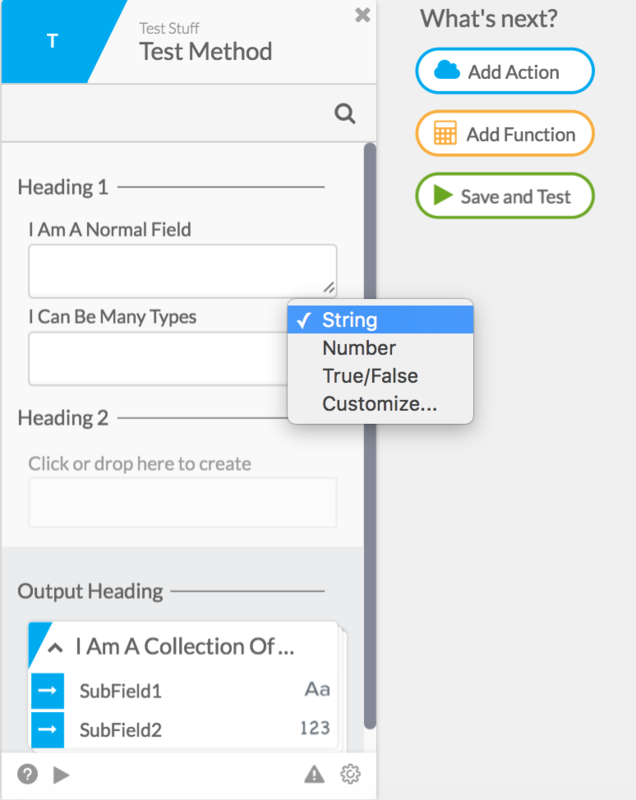 _Setting available types for input fields- _You can also set the option for users to be able to pass in multiple types to a field. 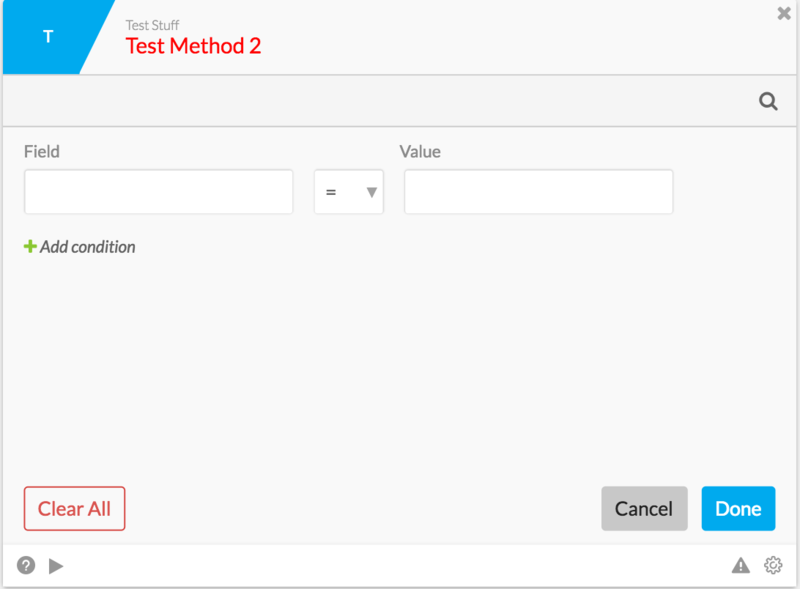 This means that the user will select which type they would like to pass in, and then drag the appropriate value in. 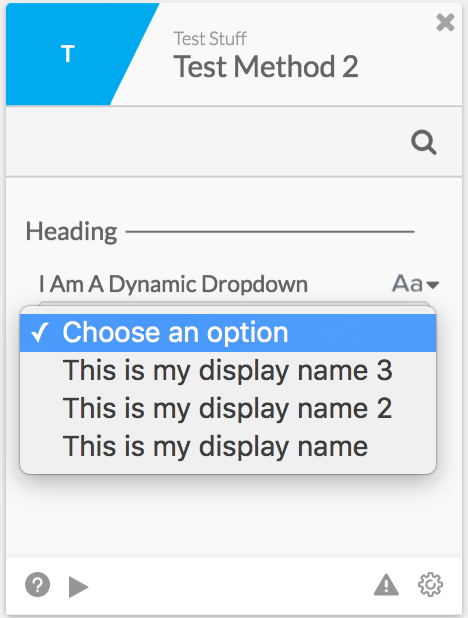 Setting an input field to take in an option- Input fields may also be set to appear as dropdowns, rather than fields that users drag items into, or input manually. When doing this, make sure to think critically about whether or not this input should be a parameter instead. "value": "But I Actually Equal This 3"
"value": "But I Actually Equal This"
"value": "But I Actually Equal This 2"
_Setting inputs to be required- _If your service has some values that are required to operate properly, you can set a field to be required. When an input field is set to be required, it will cause Azuqua to display an error to the user if it is not filled out. Setting a default value for your input- Sometimes it’s useful to set a default value for inputs that are not required, in case the user hasn’t filled them out. Setting a distinct display name for your input or output- It can be quite useful to have the name your user sees while building FLOs with your connector be different than the name you use internally to use that input/output value. This allows you to change your input/output’s name on your card without having to change anything about how your connector works. To do this, set a _“displayname” _field inside of your input object to be the value you would like to appear on your card. 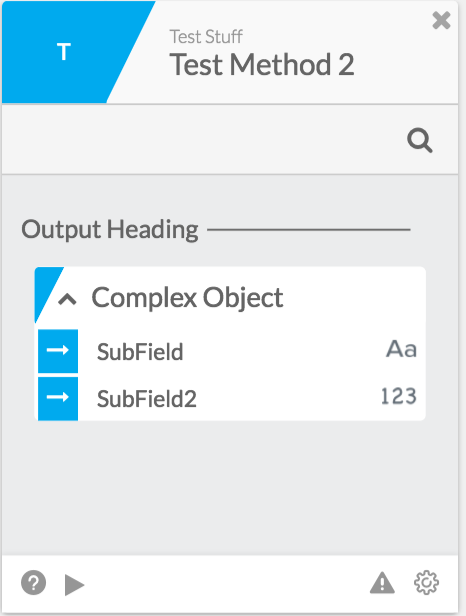 Setting your input/output field to be an extensible set of items- Sometimes you want your connector method to be able to take in many user-defined fields. 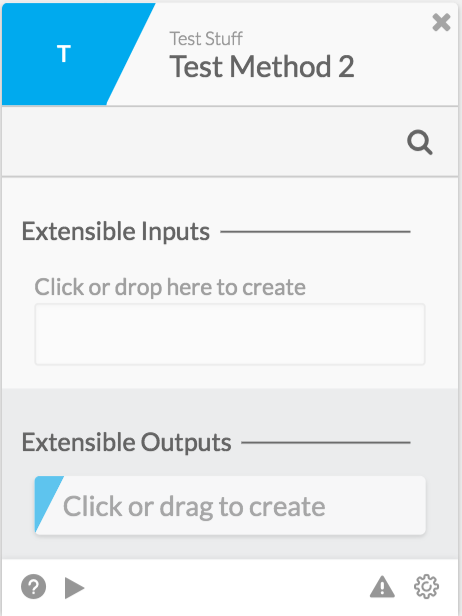 To do this, you can set your input/output field objects to be “extensible”. While users are building a FLO with your card, they’ll be able to add as many fields and values as they would like. To enable, set an “extensible” flag to true inside of your extensible heading group instead of an “attributes” array. 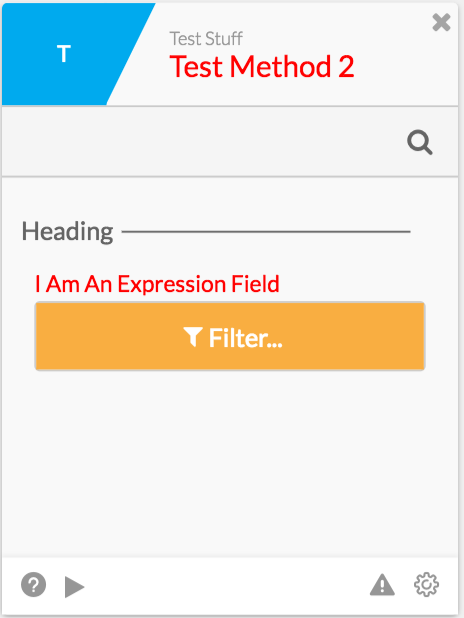 Setting your input field to be surfaced to users using the “expression builder” UI- You can also have fields that will surface in the designer using our expression builder UI, so you can ensure that all expressions that are passed into your connector are valid. To enable, set a flag _“expr” _to true inside of your input field. If you would like to make the left side of the expression builder (“Field”) be a dropdown, you may add the _“exprFields” array. This “exprFields” _can also be dynamically generated. The below example will show all three types of expression builder configurations. Unless otherwise noted, you may mix and match these type flags and modifiers however you would like, on both inputs and outputs on your connector method UIs, as you can see in the above examples.